Russian President Vladimir Putin's penchant for bare-chested photo-ops is getting lots of attention from people around the world. People are urged to follow the Russian leader, who loves outdoor wild life as much as possible. 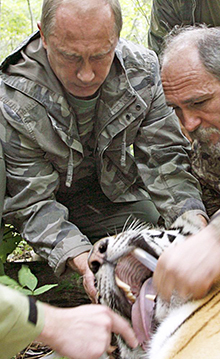 Putin also loves take pictures with tigers as if he is symbolic of power. 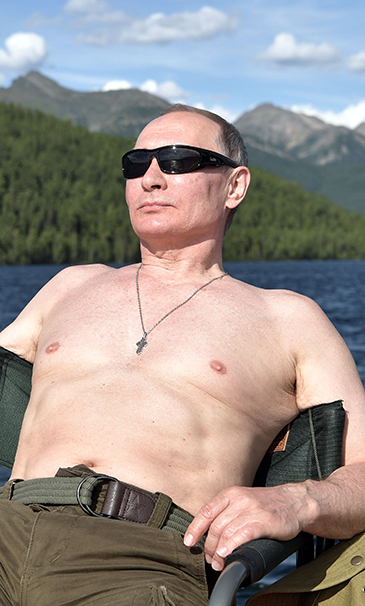 In many SNS sites on the internet this phenomenon is dubbed "Putin shirtless challenge." 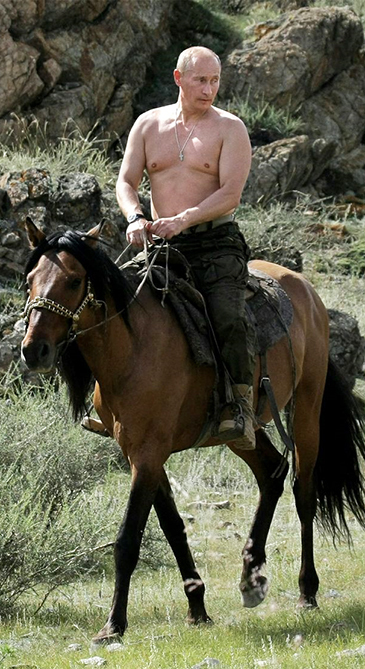 Vladimir Putin is probably the coolest guy on the planet. This fact is nearly indisputable. He’s best known as the current Prime Minister of Russia and former President, but few know the real man behind the power. He’s an advocate of many great causes for the Russian people, especially wildlife. I love animals, and it’s certainly one area where his aura shines most brightly. Nursing baby elk is a joy few ever get to experience. He understands the plight of the polar bear and has geared efforts towards saving the population in northern Russia. By far his greatest macho cause is protection for the endangered wild tiger. He is the man, and he’s a man of action. Putin not only saved the camera crew from certain peril, he managed to show tender loving care to the often misunderstood cat. His love for animals knows no bounds, for even small ones that can’t fend for themselves nestle comfortably in his warm hands. Because of his many good deeds, Prime Minister Borisov of Bulgaria bestowed upon Putin a really cute shepherd dog as a gift. The new dog now joins his long time mate Koni, who often accompanies Putin on business. He’s not really a doctor, but he does visit injured troops when he has free-time in Moscow. Outside of Moscow he fancies himself a world-class swimmer, which is understandable considering his fine form in the butterfly. The people of Russia love him, and so do dolphins. The slopes can’t hold him back either. He could easily be a stunt double in a James Bond movie. It helps that he’s never strayed from the opportunity to show off his manly bare chest. His adventures in shirtless fishing are inevitably admired by our friends in the Mid-West. He also shares my affinity for the long pole. The wilderness is his domain, where he feels at one with the universe, even among the lonely bear. He likes checking out bears on top of safe bridges, because nobody is stupid enough to wrestle bears! But I bet that when bears see him coming, they turn around and go away. He’s a sportman to the power of 10, will even rough the tough seas with a crossbow going after grey whales. Back home he’s been known to show-off his superior skills at judo. They both share the same sort of witty repartee. He also parties with international film star, the “Muscles from Brussels,” Jean-Claude Van Damme! Van Damage to bottles of vodka! Naomi Campbell causes damage when she throws her diamond encrusted BlackBerry at people’s heads, so he made sure she checked her bag at the door. That meal at 10 Downing Street must’ve been delicious. I’d love to eat his food just once! I wonder what type of meal Kim Jong-Il served him. If it were to be dog, we all know that Putin would put Kim on blast. I’m getting my significant other this T-shirt because her birthday is coming up. Putin joined the cagey KGB in 1975, which explains his extraordinary survivalist expertise and is known as a master marksman. Every now and then he sports the traditional apparel. What can appear to be a diplomatic failure, as far as a photo-op goes, can miraculously turn into just about the coolest thing ever. Chilean ponchos are underrated, I want one! George W. Bush famously said of Putin, “I looked the man in the eye. I was able to get a sense of his soul.” It’s simply amazing to ponder all of the places the windows to his soul have seen, but that thought comes into sharper focus when you realize he can fly bombers. When he isn’t patroling the skies looking for bad guys, his chief source of transportation is the often reliable Harley-Davidson. Too cool for words. He always rolls deep with his posse, not sure if they arm themselves with switchblades since the roads have been cleansed. He’s just like us too, because he pumps his own gasoline. He, like many of us, feels the crunch of high gas prices. He’s apt to burn a lot of fuel when traveling at high rates of speed. Historically, Putin was allegedly one of the main orchestrators behind the infamous Putsch. The coup attempt, which eventually led to the ouster of Mikael Gorbachev, directly or indirectly, led to Boris Yeltzin becoming a national joke. The rumors of his affinity for vodka were not fables, they were firmly grounded in reality. But finally, after one too many blackout drunk falls, he surprisingly handed the reigns of the nation over to Vladimir Putin. Like a real man, he still discusses important issues over a beer, which is admirable, especially if it’s High Life. His concern over the state of education has been one of the defining issues during his national service. I think one of his greatest accomplishments was being the key leader behind instituting a flat-tax in Russia, something Steve Forbes championed during his ill-fated presidential run. His close relations to the Chinese people are often touted as one of the main reasons for their rise to economic world power, and their mutual respect has made them arguably the world’s most influential allies. Russia no longer has shortages in toilet paper. That may seem a bit below the belt, but it’s true. Movies like “Moscow on the Hudson” made fun of Russians for standing in line for one roll of toilet paper. These sort of stereotypes used to be commonplace. This is no longer the case and should be purged from all mental notes on the Russian people. Those generalizations of Russians surely give Putin the last laugh from high atop a tree. “This is true. I am the richest person not only in Europe, but also in the world. I collect emotions. And I am rich in that respect that the people of Russia have twice entrusted me with leadership of such a great country as Russia. I consider this to be my biggest fortune. As for the rumors concerning my financial wealth, I have seen some pieces of paper regarding this. This is plain chatter, not worthy discussion, plain bosh.